Director: "OK. Let's try that again." (Translation: that was absolutely crap but I'll give you another chance. Now, pull yourself together and don't blow it.) "Now I want you to imagine that you have a cat. It's (he gestures vaguely about) somewhere around and maybe it'll come over whilst your making your tea." Directors can fit so much meaning in just a few words. It's a real talent. On Friday, I went to see Mr G., our new accountant, and although we had spoken several times on the telephone and emailed back and forth, we had never met. (Just for the record, Mr G. is not a parrot.) When he came to greet me in reception, he looked nothing like the image I had conjured up in my mind. (He was older and wore glasses but apart from that I had him completely wrong. Completely.). It was like expecting your great uncle by marriage and instead shaking hands with a giraffe. Not that he was particularly tall or giraffe like you understand. Just not what I was expecting at all. And to make matters worse, I don't think I was what he was expecting either. 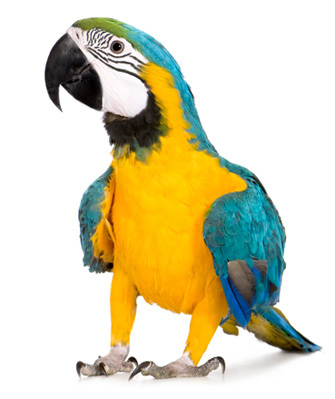 He acted a bit as if I was a talking Macaw mistakenly flown over from London Zoo and now perching on the back of a chair in his office expecting a masterclass on VAT returns. (Note: VAT is a tax on goods and services here in the UK, EU and Australia - amongst other places.) It was kind of awkward. For both of us. So to break the ice, I told him about how I'd passed my Financial Regulation exam. Macaw or not, the VAT masterclass was masterful. I don't know how the giraffe would have managed VAT 101 but Mr G. was magnificent. He taught me all the basics. And how to file my VAT return online. I left his office and sauntered on home buoyed by the bliss of ignorance. It's amazing how dangerous a little knowledge can be. Great read! I totally agree about the cat btw, pretending it's there is one thing, but pretending it's there without them telling you its name?? Unnecessarily difficult for you and disrespectful to the cat! As you can see, I got my own blog. So far I had only posted what I already wrote on CJ's blog but just now, I somehow copied your wonderful and very funny (although cats don't laugh) blog onto my blog. I didn't mean to steal it, honest. But it can stay if that is ok with you? Especially loved the translations for the director's comments! Was looking for translations for what the imaginary cat thought about your audition.